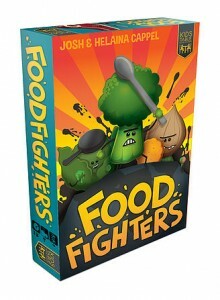 Food Fighters is a 2 player game designed by Josh and Helaina Cappel. Josh is an experienced game designer (Wasabi, Bomb Squad Academy) and popular game artist (Belfort, Garden Dice, Scoville, Kings of Air & Steam, Pandemic, etc.). Helaina is an educator and founder of Kids Table Board Gaming. This game is a player elimination style of game with some fun dice rolling mechanics as well as a bit of card drafting and component collecting opportunities. The official retail release date is March 7, 2016, but this game is already a successfully funded Kickstarter campaign. The rule booklet is fun and well laid out. The game mechanics are clear and well balanced(though the power cards initially felt uneven, further game play changed our opinion). On their turn, each player completes three actions- a) Roll for Beans or Swap fighter tiles or Attack b) Spend Beans to buy a tool from the pantry c) Allow opponent to repair their formation. After these actions are complete, play passes to the opponent. The ultimate goal is to be the first player to knock out three matching enemy fighters. Rolling for Beans is self explanatory and simple. The active player rolls the dice and tallies the number of beans (you can re-roll any splats). You collect your beans which you can later use to buy a pantry item. Beans are the currency of the game. Swapping is also very simple. Players can have any two Fighters (on their own side) switch places or have a Fighter move to an empty spot in the same row. Fighters bring along any items they have. Don’t forget- swapping gets you a free bean! Attacking your opponent is slightly more complicated. Players attack their opponent by declaring which fighter is attacking which component and then rolling the normal dice for splats. Splats knock out the opponent and allow the player to claim the card for the defeated Fighter. There is an option to purchase a bonus die which can help your chances along the way. Don’t worry too much if your attack isn’t successful. You still get to keep the beams you rolled! During the player’s buying action the player spends their beans to buy pantry items. Crackers let your Fighter take an extra hit, spoons let them hit targets further away (but still in a straight line) and pans let them attack any enemy that is in range. Players could also purchase and use one of the special power cards. Each card is unique and has its own price, abilities, and flavor. These purchases allow for some of the deeper strategy to come to the table. Finally, the opponent must fill in any gaps in their play area by bringing a Fighter forward from the furthest bottommost row with Fighters left in it. The entire concept of a food fight is inherently appealing to children and the myriad of choices and surprising complexity makes the game appealing to adults as well. Though the game is rated for 8 and up, the reading is minimal and the mechanics are clear enough that a player as young as six can join in the fun. We played this game with a variety of ages ranging from six to adult. Each game was different and the players got better at strategy each time they played. We LOVED the clings which allow you to add even more variety to the game without damaging the tiles. Our kids giggled constantly at the artwork while playing, and food puns flew across the table. We are also super excited about the Grains and S’Mores expansions which will allow for even more variety. Our only wish was that there were more Power Cards to draft. We think this would extend the length of the game along with adding more options and variety. This is great strategy battle game that plays quickly and is easy to learn and explain to other players. We found this game to be very replayable without getting boring for ALL of the members of our family. This game has quickly become a new family favorite and we are thrilled to have it as part of our collection.